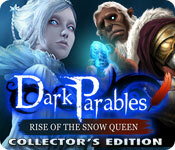 Dark Parables: Rise of the Snow Queen Collector's Edition is rated 4.6 out of 5 by 251. Rated 5 out of 5 by JocastaSilver from A Suspenseful Frozen Adventure This is an exciting game featuring the fearsome Snow Queen of local lore. The FROGs were fairly straightforward and easy to solve. Any time I got stuck, I was able to consult the guide for assistance. There was also a bonus game featuring the tale of Hansel and Gretel which ties to the main game in surprising ways I won't reveal. Rated 5 out of 5 by BittersweetAnne from Loved Everything But I loved everything but the price . I bought the original but the bonus chapter looked fun so i re-bought it as CE. Big mistake. The bonus chapter was really and gave us some more insight but that is the only special feature. You can't earn achievements , review any pop ups or review the parables. That was very disappointing. I have bought other collectors editions and it included all of that and then some. You get a couple of wallpapers and that's it. Also the biggest letdown you have to finish the main game and the bonus chapter to unlock any bonus content. Buy the main game and you wouldn't be disappointed. Rated 5 out of 5 by clarkpyle from MASTERS OF GRAPHICS This is the BEST and MOST BEAUTIFUL HO CE game I have played out of the 100+ game I own. Kudos to the Production Directors, Steven Zahos and Gavin Wong (yes I read the credits at the end of the game). I have withheld from buying the games, Dark Parables, because of the name...."Dark....". Most of the "Dark-type" games are about phsyco something and go into real darkness with murders, asylums and such. But when I read the review of Snow Queen and Swan Princess I decided to give the demo a try...WOW! I was totally surprised. BFG has toooo many "dark" games and not enough of the games like Snow Queen. The graphic were amazing and mesmerizing! MORE, MORE, MORE please!!! Rated 5 out of 5 by Boomer1097 from Snowy Fun I enjoyed playing this game. You play as the detective and are searching for missing children from the village. You enter the snow kingdom and go from there. The graphics are excellent. The voice overs are well done, but the music was a bit annoying so I muted it. There are lots of places to visit and items to collect to get the back story. The FROGs and mini games are fun to play. There is a map that is helpful most of the time. There is a SG that you may have to use at a couple points in the game. The story had a satisfying ending and I enjoyed the bonus chapter. This is a long game, which I like. I recommend this game and am looking forward to playing the next one in the series. Rated 5 out of 5 by andibeard from My Entry into the DP Series This was the first Dark Parables game I've played, and I really enjoyed it. These games are FROG adventures with consistently high-quality graphics and fairy-tale based storylines. I enjoyed the FROG scenes and found them quite challenging in some cases, though the florid art style might not appeal to all players. The morphing objects were also challenging in some scenes, as were the mini-games. Overall, a lovely and fun game with a somewhat refreshing take on "dark" fairy tales (it's not the same old bad-guy plot!). Definitely recommended, especially for those who like fantasy-based games. Rated 5 out of 5 by MysteryAngel145 from A great twist to a well loved tale... I have always loved the story of the Snow Queen, ever since I was a child, and really enjoyed this twist to the classic tale! Being a fan of the Once Upon a Time TV series, I don’t mind when these new types of fairy tales integrate classic tales to make one unique and sympathetic “evil” character, still noticeable from the classics – as long as it’s done well and is cohesive to a good plot, making sense. It gives it a new, fun twist that I love – and this story idea was done very well and was a lot of fun to play! The children were adorable, made you want to save them... Don’t wish to spoil any of the story, so will say that the plot intrigued, even left me misty-eyed at some points – with a very satisfying ending that (again) left me in tears and with the feeling I’d accomplished something good… HOS (FROGS) –Loved them– and this game contained fragments of important things needed to fit together for the objectives – some easy, some a little more difficult to find- a good mix - but also very often pretty and fun to look for (gemstones, filigreed gold & silver pieces, ornamental crests, etc) Puzzles were sometimes the type that you had to really study the scene, to figure out the instructions (not written out, but symbolic) to figure out how to play. I actually like those- it makes me think harder and gives me a stronger sense of accomplishment when I’ve figured out the unwritten riddle. I only had to consult the SG once to see how a game started, then did the rest on my own. Music was lovely, fitting to theme. The graphics were beautifully drawn – in keeping with the wintry/fantasy feel of the game - and most of the time very pleasing to the eye. Bonus stuff: I forgot to find all the morphs, was so caught up in the game, then couldn’t remember what area I’d located them in to try to go back and get the others (lol) but I did find half of them, and it did make the hint button fill up faster, though I didn’t use it very often, but that was pretty cool. 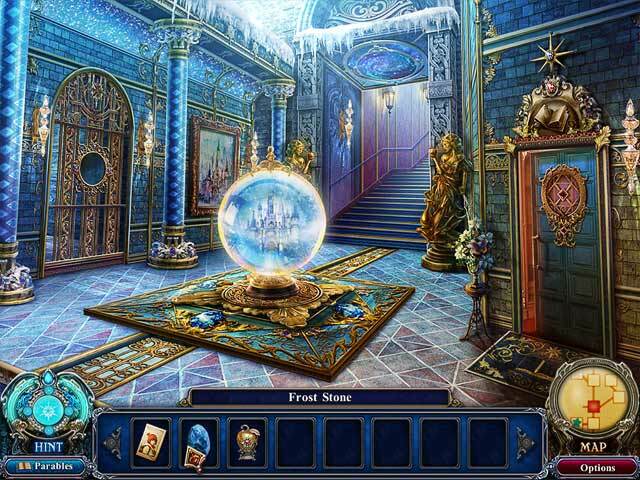 This is my 3rd full HOS game to play here – Phantom of the Opera Mystery Legends, my topmost favorite, is what brought me to this site and made me a fishie a month ago, now the owner of 40 games, (from the summer sales I've been taking advantage!) This has become my new addiction. ;-) – I also recommend Nevertales: the Beauty Within)… and after playing this Dark Parables game, I ended up buying three of the others, though haven't played them yet. I wish though I would have gotten the SE for this - the bonus chapter had nothing at all to do with these characters and didn't add to or enhance this story - but focused on another fairy tale (Hansel and Gretel), which was okay- but I could have definitely done without confronting the giant spider! lol And since I forgot about finding all the morphs, I was so caught up in the many tasks, I didn't really miss that aspect of the game either. I'm not big on wallpapers, looking at the concept art, etc, so if you aren't either, and the above extras don't really appeal, I'd go with the SE. Rated 5 out of 5 by EvilPrincess1426 from Loved the story. I loved this game, once again the visuals were amazing and, the story line this time was even more enjoyable, mostly because while it had a fairy tale character that everyone knows, they kind of portrayed her in a different light and that was really intriguing and enjoyable for me. Rated 5 out of 5 by pennmom36 from Dark Parables: Rise of the Snow Queen CE Dark Parables is by far one of my favorite series of games, Snow Queen is one of the reasons I love these games. Dark Parables takes the usual fairy tale and gives it a bit of a twist to make the usual unusual. The Snow Queen has been nothing more than a folk lore handed down for centuries, now she has been seen by several people of the town causing most of them to flee, even worse several children are missing! 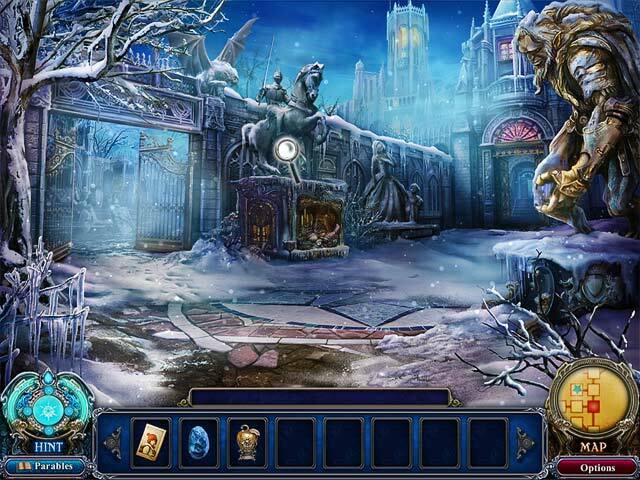 It's your job as a detective to investigate the Snow Queen, fact or fiction, and of course rescue the missing children. The graphics are stunning, there is a particular style of beauty that only Dark Parables seems to be able to accomplish. There are 20 morphing objects to find which will upgrade your hint meter to refill faster with each morph found. Keep in mind that the objects won't necessarily morph when you first see them, some require a certain action or chapter to activate them. This game is also famous for the collectible parables, several gems in several parable stories and when you find all of one parable, you can read a story about it. 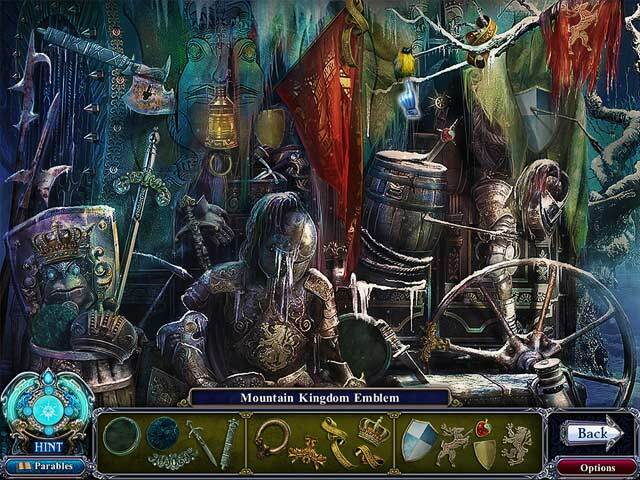 The Hidden Object Scenes are actually Fragmented Object Scenes where you find fragmented pieces in three sections and when all pieces have been found they fit together to form a single item that will be used as inventory such as a trident or an emblem. There are tons of mini games, most of them involve creating a path using the correct number of colored tokens as shown above the game. This Collectors Edition includes puzzles, wallpapers, concept art, music, movie gallery and a bonus game, Hansel and Gretel. I always opt for the CE simply because of the morphs that are incredibly well done, enjoy! Rated 5 out of 5 by StellaEterna from Another Blue Tea Success! Blue Tea has consistently shown me that they are capable of making excellent HOGs. This installation of the Dark Parables series is beautiful to watch and very challenging at times. A few of the mini-game puzzles really through me for a loop, while a few them were unbelievably easy. I suppose, overall, they balanced each other out so you won't get frustrated. If I had to give this game a complaint, it would be that the HOPs were very redundant after a few hours in. The general strategy behind them is to locate specific pieces of an item that you are trying to build, rather than complete specific items. This allows for a a lot of detail-oriented searching and, when placed against the backgrounds, is a lot of fun to find. After a little while, though, you begin to see the same HO backgrounds with new items to find. I actually got to the point where I didn't have to even look at the 'items' I was trying to find below; I could just start scanning the screen and picking out the visual aspects that I recognized were not part of the original background and then also pieces with a type of architecture that the designers really liked to use. This is not a terrible thing, so please don't let it dissuade you! I enjoyed this game so much that I beat it in one sitting, so that shows how captivating it is, but I just wanted to mention that because I did find myself getting really tired of the HOPs near the end (of course, like I said, it was all one sitting, so that could have something to do with it!). Overall, a really great game and worth the money. If you enjoy this one, I highly recommend my favorite game from Blue Tea, "The Crooked Man with the Crooked Cat". It has similar HO strategies, but it abandons you in a world of pure darkness and intrigue that I was fascinated by. I really enjoy this developer!